We got up while it was still dark, awakened 4 little ones out of bed and got them bundled up. It was the first day the temperature had dipped below 50 degrees this fall and now it was just above freezing. We fueled up with Dunkin’ (because there is no better excuse to stop there than an early morning road trip) and drove into Atlanta. We hit no traffic and were there in plenty of time to get settled and ready. And then we heard it… 3, 2, 1… it was time to go. So we walked a bit. And then I would encourage her to run with me again. And she would say, “No, Mom. No.” She would even hold my hoodie trying to get me to stop. …Here’s the mean Mom pushing her daughter to do something she didn’t want to do. But you see, I know my daughter. And I know when she isn’t sure of the path or her ability, she gives up. She rather miss out on experiencing success than risk failing. And she fears this so strongly that she’s willing to yell at the top of her lungs, “No!” even when we are doing the very thing she says she can’t. So, I didn’t listen to her pleas to stop. 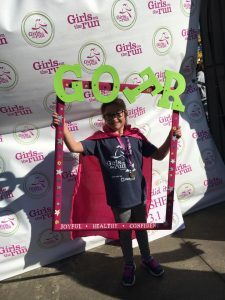 I kept going, kept getting stares and kept encouraging my daughter to run, doing counts of 10 running and 20 walking, over and over again through the miles of Atlanta’s streets. Even as we sprinted the final leg of the race and saw the Finish Line ahead, she pulled on my hoodie, still begging me to stop. I gently pulled her hand off my hood and held it in mine as we crossed the finish line. Together. And just as I knew she could, she did it! 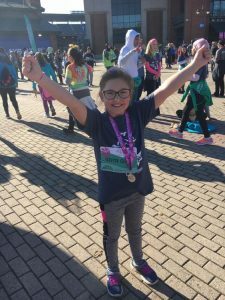 She completed her first 5k! Like a momma does in these moments, I started to tear up. Seeing my daughter accomplish such a big milestone was one of the most rewarding parenting moments of my life. That night at dinner we were playing a game with our friends who had come to town for the weekend and were part of Bella’s cheering squad. We were going around the table and sharing some of our favorite things about each other. I told the kids they could skip us moms, but Bella said she wanted to go. I mean… it melted my heart. And that’s the thing, isn’t it? We need a coach in life, business, family sometimes… one who isn’t just there to tell us what we want to hear, or to “be nice,” but will instead push us past our comfort zones to do things we sometimes believe that we can’t. Coaches who won’t let us stay in the “safe zone” but will provide that one final push we need to reach the finish line. You see, I didn’t run the race for Bella. She did it. She just needed someone encouraging, to believe in her in the moments she didn’t think she could. Do you have a circle who cheers instead of jeers? For crossing whatever finish line you are seeking right now? For believing in you when you sometimes aren’t sure that you can? When the path isn’t clear and success isn’t inevitable? In the most important moments when you are truly outside of your comfort zone? Surround yourself with those whose agenda is greater than their own and watch the magic happen. Both in your life, and theirs. Looking for a community of those who encourage, inspire, and keep you accountable? Join us now at Powerful Professionals Business Coaching. Find out more here. Great story! As a mom I totally identified with Bella, she reminds me of my daughter and I totally agree, with the right cheering squad we can accomplish anything. Isn’t that the truth? Happy Thanksgiving!